On 15 April, I drove out to Battle to see what, if anything, was left of the nodal point defences. 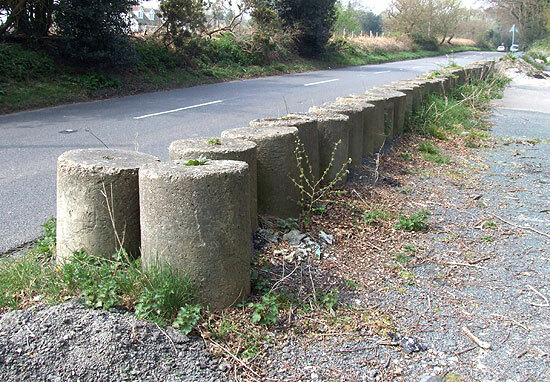 On the way, I drove past this impressive line of 47 roadblock cylinders blocking off an old lay-by near Catsfield. This is the largest number of cylinders I've ever seen together, but unfortunately, this indicates that they're probably all ex-situ. 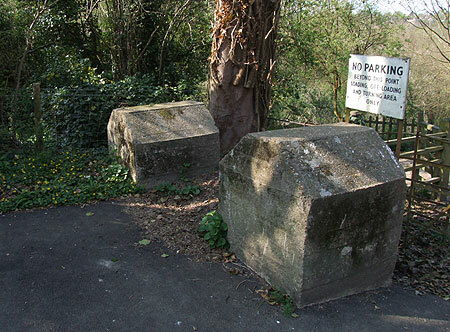 Cylinders were intended to be placed in clusters of three, but the narrow road would not need this many to block it, and so the local authority has probably removed them all from their original locations to here. Parking up in Battle, and armed with printouts from the Defence of Britain Project database, I wandered along the High Street and found what I was looking for - evidence of the anti-tank perimeter of the nodal point in the form of cubes. There's quite a few here; a good line still survives alongside a public footpath, but the undergrowth is such that few are still visible. Another line on the other side of the road and a few hundred metres to the west has unfortunately disappeared under a housing estate; I did, however, find a sole survivor in a hedge adjoining the development, so at least a small trace remains.